All of a sudden, a party, a cabal, a team, a group or power wielders and mismanagers of Nigeria got jolted. In the very beginning of the year 2018, the party in power and their leader had declared that they don’t know the meaning of restructuring. Some of them had said earlier they are against restructuring and it is a call by those who lost power that want to confuse Nigeria. Last year in a TV discussion one morning, Nasir El-Rufai, the know-it-all governor of Kaduna State had chided every call for restructuring as opportunism and the job of those that lost power and want to destabilize the nation. He also alluded that the calls are from those that eye the presidency. And if we would take that position, begging for his franchise, then El-Rufai singing a pro-restructuring tune now is a sign that he desperately wants President Muhammadu Buhari in power beyond May 2019. This position was also shared last year by the leader of APC, Governor John Odigie-Oyegun who argued that the calls come from those that lost power. But for the intervention of law enforcers, Governor Adams Oshiomhole would have got the wrong side of Nigerians at the Sheraton Hotel Abuja when last year he dismissed all calls for restructuring as rant of those that lost election in 2015. The way the crowd shouted him down made him know he threaded on dangerous ground, but most of all signaled that the wish of the people of Nigeria is a Nigeria with a different structure. When the issue of restructuring got so heated last year, APC deceitfully set up a panel headed by El-Rufai on true federalism. We knew the intent and also knew the conclusion before it was announced last week. The ground rule is deceit. It is about trying to play on Nigerians and buy time and like I said earlier, since according to the Kaduna governor the calls are by political desperados for the presidential seat, we see it clear that the APC committee led by him making a full circle in just few months after and recommending restructuring is grand political deceit. And the only way the party would prove all of us wrong is to initiative the move from the National Assembly or a summit on restructuring and get it done before the next election. The whole gave is to hoodwink Nigerians and take up the false face and campaign on restructuring to gain power after which the issue is frustrated. Unfortunately for El-Rufai, Nigerians are not fools or gullible and his name doesn’t sync with national unity. He is a sectional champion and can’t change his ethnic garb today for any genuine reason. A good example among many others of his ways was when he recently told the media that there was no reason justifiable to give the South East a sixth state because ‘Nigeria should never create eqauls out of unequals’. And he never explained why the likes of the South South and South East that produce the oil that feeds Nigeria get a paltry percentage of the proceeds while those that have none, like his Kaduna take the lion share. Who is the equal here and who is the unequal? El-Rufai doesn’t have that aura of a person with Nigerian outlook, therefore, nominating him to head that APC committee was abortion already. There is no way someone with skewed mind against others would produce a document or conclusion that defines fairness to all. In totality, whatever he produced in the name of endorsing restructuring of Nigeria in the 12 points he itemized including resource control are superficial and targets to win votes for his principal and his party. So we challenge him to implement the recommendations before the next election and let’s see it happen because Nigerians rooting for restructuring are not so stupid or bland in mind to believe him without any substance. The APC has a game, even if they push the issue to national debate, the same leaders from the north would instigate their people at the National Assembly to rebel against it the party washes its hands off the failure. We know the games and won’t fall for it especially when El-Rufai lives with this notion of a superman like he wrote in his book after serving in President Olusegun Obasanjo’s administration. He is one of the Nigerian politicians that lay claim to over bloated superhuman status. He thinks himself smarter than all from his conceited words and choice of indiscretions. Among the elite of the north I have observed so far, he and Nuhu Ribadu live with the worst sense of non-existent super self rating. No doubt, he would have told those that sent him on that errand to watch him spin the magic and force it down our throats as the self acclaimed smart alec. This time, oga governor, your magic lacks potency. The only potency from you that would work or make anyone listen is putting restructuring down and running before the elections come. And to let El-Rufai know how acceptable his words are, let him take cognizance of the harvest of disbelief from Nigerians since he released his false impression papers purportedly the position of APC on this burning issue. And come to think of it, how many words or promises of the party in the past since 2014 campaigns have seen the light of the day? From power and electricity fixing to education, price of petroleum that was promised to drop has rather escalated. Not even one word of the part is kept, except buck passing. So the tricksters can’t learn a new trick with restructuring. The strategy is to make Nigerian lower their guard and be taken unawares and that is too late and too unworkable. We haven’t forgotten that July last year, El-Rufai had concluded that there is no restructuring left because according to him, President Buhari had by his mode of administration restructured Nigeria totally. He never told us when the same Buhari un-restructured the same Nigeria between July last year the release of his report. Even then, what greeted his rash position was severe outrage by the people of Nigeria. Now, to make him know that he has not been the credible character in the restructuring call, all politicians outside the APC and even the civil society and the media never believed him because they know there is no substance in his acclaimed new stand. It’s all insincere lies and politicking by the APC using El-Rufai as arrowhead, although it doesn’t matter who champions it because whatever comes from the Buhari stable can never be the right position on the subject matter given the utterances of the party even though their constitution provides for it and also promised Nigerian voters that during their campaign. 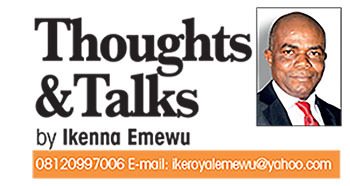 We have come a full circle with the APC and can predict at any point where they are headed, and that must be in the wrong direction – direction of saying one thing and meaning another. To Senator Shehu Sani, Nigerians should not take El-Rufai seriously on the report and to Governor Nyesom Wike, he intends to hoodwink the people rooting for restructuring. So how come the North that blocks the ears when restructuring is mentioned sprang a surprise and did a full turn? Hear this Nigerians, if you mean well for yourself, never take El-Rufai as meaning what he says or saying what he means. That is his way of commencing or flagging off the campaign for his boss for 2019. He wants to sell his dummy and get votes for Buhari and when he settles in, he changes the game. When I grow up, I want to be like Babasanjo!